The Natyasastra is probably one of the earliest and certainly one of the best treatises on Indian Dramaturgy. At the same time, the book available now is not an early one but may be as late as the seventh or eighth century AD. The authorship is traditionally ascribed to Bharata, the Sage. 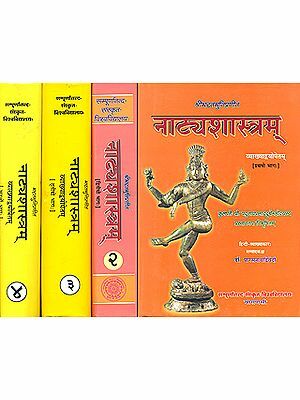 The eminence of Natyasastra is not that it was the first book on the subject but that it was the first book on the subject but that it was the first comprehensive treatise on Dance, Drama and Music. 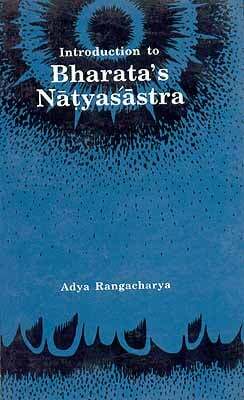 Like the Mahabharata, Natyasastra too boasts that "What is found here may be found elsewhere. But what is not here cannot be found anywhere". To confer upon it prestige as the sole authority, it was described as the fifth Veda - a Veda Accessible to all the castes of society. The essential elements of stage-craft have been described by the Natyasastra thousands of years ago. The question arises, naturally, whether such a treatise can serve any purpose of our time. This was the very question which the author set about to explore in the present translation and his notes on each chapter amply demonstrate how latest problems of actors and directors have been anticipated and resolved in it. This is a translation of thirty-six chapters of Bharata's Natyasastra - Sanskrit treatise ascribed to Bharata. At the same time, this is not a translation of each and every verse. The reason for this is that the texts are rambling repetitive, contradictory and even of doubtful meaning. Word to word translation of each and very verse would not convey any idea of the importance of this first and the most ancient Indian work on dramaturgy. I have consulted the text published by Dr. Ghosh and the various reading and tried to give the correct meaning. At the same time, in certain contexts (particularly about the movements of hands, feel etc. ), I have translated almost each and very verse, so that the reader may find how scrupulous, deep and detailed the book is. There is one thing to be remembered in connection with such books in Sanskrit. No writers are as interested in details, divisions, sub-divisions and even sub-sub-divisions, as our Sanskrit writers on technical subjects are. I have added notes to each chapter in which I have discussed and/or explained complicated ideas or irrelevant passages, etc. If, in some cases, I have given a free translation, it is only with the intention of saving the reader from getting confused. Personally, I feel happy for two reasons: it was a long-felt wish of mine to study critically, to translate and to edit the Natyasastra. When thirty years ago, I resigned from my academic position as teacher of Sanskrit in a college, I had to give up my ambition. Now, the second reason: through gave it up, my wife who shared my ambition, kept it alive, often to my annoyance. Now, I am thankful to the publishers who approached me with the proposal of translating this work and who were kind to accept my method of translation as mentioned above. Almost a thousand years ago a write called Dhananjaya wrote a treatise called Dasarupaka (ten forms of plays). He did what I originally intended to do, viz. abridge the work only as far as it concerned drama. Let me conclude with his works. It was God Brahma who extracted from the four Veda-s their essence and created the Natyasastra out of it; it was the sage Bharata who put it into practice; and it was God Siva and his consort Parvati who (respective) contributed the Tandava and the Lasya dances. Against this galaxy of authors, who contributing my little mite to revel the excellence of the work. It is for research to deciders to decide if that 'little mite' of mine has been worth its while. The Natyasastra is probably of the earliest and certainly one of the best treatises on Indian dramaturgy. At the same time, the book of 36 (or37) chapter available now, is not early one, but may be as late as the seventh or eighth century AD. The authorship is traditionally ascribed to Bharata, who was considered to be a sage. But even that may be doubted. The original work, the text says in its first chapter, was composed by God Brahma for the celestial immortals rules by Indra. In the last chapter, it is said that for the terrestrial world, it was (re-) composed or edited by Kahala, Vatsys, Sandiya and Dattila, who are mentioned both as the sons and disciples of Bharata. But these are only names; nothing more is known about them. There is, however, evidence to show that dramaturgy was studied even before Panini, the grammarian (third century BC.). Panini refers to Nata-sutra-saphoristic guides for nata-sby two persons, Silalin and Krsasva. Thus is the only mentio of these two writers of aphorisms on dramaturgy. 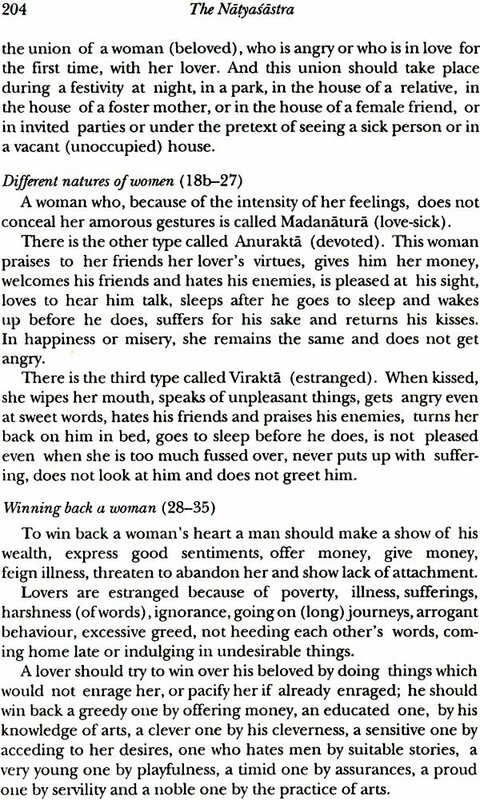 For this reason, Bharata's Natyasastra may as well be a Sastra on dramaturgy for Bharata-s, i.e. actors, instead of, of Bharataa sage-writer. Though the treatise was, now and then, referred to by the later commentators on Sanskrit Dramas, the original text was not available till about a hundred years ago. And even then it book almost three quarters of a century for the whole text to be made available. Another work called Dasarupaka (tenth century) mentions Bharata as a muni who produced the first play based on God Brahma's Natyaveda, it does not mention the name Natyasastra, though the author says he is abridging Bharata's work in his (Bharata's) own words. In 1865, Fitz Edward Hall of U.S.A. discovered seven to eight chapters (17-22 and 24) of Natyasastra and published them as an Appendix to Dasarupaka. In 1874, the German scholar Haymann published an article on them. The interest created induced the French scholar Paul Reynaud to published a critical edition of chapter XVIII. Four years later, in 1884, he followed it with critical editions of chapters XV and XVI. Then in 1888, chapter XXVIII was published in France. It was only in 1926, that too after an edition 30 years ago by K.P. Parab, that for the first time in India, the Gaekwad Oriental Series, Baroda undertook a critical edition; but it published only the first seven chapters. This was followed by the Benaras and the Nirnayasagar edition with different readings as footnotes. The Gaekwad Oriental Series published, in 1936, eleven further chapters as volume II. And finally, volume III, containing chapters 19-27, was published in 1954. In spite of all these results, the final text is contradictory, repetitive and incongruent; there are lacunae too, but, what is wore, there are words and passage that are almost impossible to understand. Often times, the text of one recension has not only more verses, or less, but verses which, though broadly looking the same, have entirely different words. It is not only modern scholars who suffer this inability to understand; even almost a thousand years ago, a commentator called Abhinavagupta, very able and very erudite, displayed this tendency. In chapter II, for instance, where the types and construction of theatre-houses are described, there is one part of it which the text calls mattavarani and Abhinavagupta has more than one interpretation. The gods of eight quarters are, placed on eight sides to protect the theater. In mattavarani. Indra, the master or the patron of the show, is seated. But why is it called mattavarani, a word which means 'intoxicated elephant'? In the old architecture, the plinth had, often times, four corners of the plinth were based. Does mattavarani mean some special seat on the back of the elephant for the patron? ( a kind of royal box). We do not know. Similarly, the word dwibhumi (lit. two grounds) in connection with the theatre, where Abhinavagupta is on imagination spree. Another example, both of confusion and contradiction, is the description of three kinds of theatre-houses; the oblong, the square, and the triangular. Does Bharata suggest that the theatre-house should have that shape, or only stage is to have it? Normally, the theatre-house is supposed to be of these three types. But, as has been pointed out in the translation, there is a context in which, instead of the rangamandapa or the natyagrha (bout used by him to mean a theater-house), it is the ranga, the stage itself, which is presumed to be vikrsta (oblong) or caturasra (square) or tryasra (triangular). If this is correct, then it only means that the audience sits in front or all rounds or in front and on two sides. In spite of all the elaborate description of the construction of a theatre, its walls and its roof, in a later chapter where he talk of the success of a production, he mentions, among other things, ants and beasts as audience squatted on the ground (hence-ants) and there were no walls to prevent beasts from intruding. This kind of an open auditorium still obtains for our village shows. In the first chapter, the book being with the origin of drama and narrates how and why Bharata produced the first play. The sixth chapter begins with the sages asking Bharata five questions: what is rasa? What are Bhava-s? And what is a sangraha, a nirukta and a karika? And Bharata, concluding his brief reply, says, 'This is, in a sutra form, the entire information about natya'. The topics of the first five chapters are also included. Because of this, one is tempted to askis this the beginning of the book? Are the earlier chapters, like, the last one, added to give Bharata the credit of a pioneer? The word sutra style and then Kohala and others gave it the present form? Originally, the open field was used as the auditorium; in the course of time, a dwibhumi (meaning, either the stage was a raised platform and the audience sat on the lower level, or, the auditorium' itself had two levels) was thought of; later, a building with four walls came. And each change was incorporated in the book. The eminence of the Natyasastra, therefore, lies not in the fact that it was the first book on the subject, but that, it was the first comprehensive treatise. Like the Mahabharata which encompassed all earlier stories and philosophies, the Natyasastra too boasts that 'what ifs found here may be found elsewhere, but what is not here cannot be found anywhere'. It the book started with simple sutra-s, and if, from time to time, new experiences and knowledge made additional passages necessary, the contradictions, the confusions and the incongruities may, to a large extent, be reconciled. As a matter of fact, the very epithet of 'Veda', assumed for an advantage, to confer upon the work prestige of sole authority, turned put to be a handicap. The lengths to which some commentators went to justify the epithet unintelligible verbiage ('somehow'), often appears ludicrous. Plays were written to conform to the 'rules' of Bharata, and naturally they failed to reflect contemporary social and historical developments. Outstanding playwrights like Kailidasa and Bhavabhuti managed to introduce contemporary significance, but their attempts did not establish a new trend. Although the spoken language changed in the course of time, playwrights continued the use of Bharata's Sanskrit and Prakrt. Bharata himself had said that 'dress and speech should conform to the regional usage of the spectators; the actors and producers should observe the local modes of speech and manners and conform to them and not necessarily to what I have described'. But such sage advice from Bharata himself went unheeded. Blind faith, in the words like 'Veda', and in the authority of rsi-s, resulted in our stage getting stuck in a rut, like our society as a whole. The question naturally arises whether the study of such a treatise can serve any purpose in our age. Certainly, I may say, it does serve a purpose. Firstly, this Natyasastra remains the origin of our dramatic tradition. That traditional stage had been an attraction for our people for over thousand of years. Drama represents the ways of the world, the picture of our people's speech and manners; it is the Veda accessible to all the castes in society. However, unlike the four Veda-s, it is not confined to the realm of wisdom alone; it provides entertainments too. A dramatist, a popular theme, actors-actresses-director-producer, and the audience  these are the four essential ingredients of the theatre. There should be no weakness in any of these. The playwright should have the capacity to grasp the speech and manners of the people and represent them in an interesting way. The story should hold the attention of the audience. Physical fitness, control over voice, clarity of speech and pronunciation are the indispensable requirements for an actor. And lastly, the audience should be one accustomed to understanding, appreciation and enjoyment of the performance. These have been described as the essential elements of stage creft, thousands of years ago, by the Natyasastra. It needs to be emphasised in the present day context, that the auditorium should be such as to enable all the spectators to see and hear the actor directly. When we build vast auditoria and depend on loud speakers to convey words from the stage, we only exhibit our ignorance of the essential theatre. A study of this treatise is essential for our scholars, no less than for our amateurs. We must give due credit to the European scholars who discovered, edition and translated this treatise. They were the first to appreciate its value. Since they had no intimate knowledge of our tradition, they were sometimes led astray in their critical opinions. They believed, for instance, without sufficient grounds, that our theatre tradition was derived from the Greeks, and therefore they assigned the Natyasastra to the fifth or the sixth century AD. Our scholars, on the other hand, thought that an earlier date conferred greater prestige and assigned to it the centuries before Christ, from the second to the fifth. But in this haggling for dates, none of them seems to have taken note of the elementary fact that crimes came before the Penal Code, language came before grammar and drama came into existence before the Natyasastra. It has now become necessary to promote a critical study of this treatise, to screen the divergent readings and arrive at a consistent and authoritative text. It is also necessary to understand the various symbols in it. For example, when it says the Brahma was the author of the Natyasastra, it means that the theatre and men's interest in it have always been there. When it says that the production of the first play took place in the Court of Indra and that Indra occupied a prominent place in the auditorium, it means that play were performed in summer before the commencement of the rains. When it says that the sons of Bharata ridiculed the sages and were therefore cursed to be born as Sudra-s, it means that drama was the profession of castes considered as occupying a lower place in society. From sentences like 'May the king rule forever'- common in the closing prayers of Sanskrit plays  one can clearly infer that at the time of Bharata's Natyasastra, the theatre enjoyed royal patronage. The rituals prescribed for the worship of the stage and its presiding deity, and the use of the epithet acarya' for the drama teacher, show the importance of the Brahmin's role in the theatre. The association of other caste in the production is shown by the functions assigned to the smith, the chapter, the painter, etc., in fitting up the stage. No wonder Bharata describes drama and the Natyasastra, as sarva varnika  the concern of all caste. His statement, that the general way of life had been overwhelmed by vulgarity and in order to cleanse it, Indra requested Brahma to create the Natyasastra society. These ate the lines on which this treatise has to be studied. Mere declaration of the holiness of the Natyasastra as a handiwork of Bharatamuni, and a result to apply common standards of textual criticism, cannot lead to any kind of a critical study. The fixing of an agreed authoritative text in the first place would be a great convenience for future studies. Of the many who wrote commentaries on the Natyasastra, the following deserve to be mentioned: Udbhata (seventh century), Lollata (mid-eight century) Sankuka (AD 813), Kirtidhara (ninth or tenth century) and Abhinavagupta (eleventh century). The last mentions two others: Bhattayantra and Bhattnayaka. There were all men of learning and some of them were philosophers too; but we cannot say whether any of them had direct experience of the theatre. They were mostly engaged in refuting one another. Their commentaries supply valuable information on many subjects, but their omission to say much about their contemporary life creates problem for us when study them after eight centuries. I have made considerable use of Abhivanagupta's commentary and the edition of Dr. Manomohan Ghosh. I do not aspire for a place in the company of such learned ancients and modern specialists. As Kalidasa said in the introductory verse in the Raghuvamsa, 'the admirable qualities of those kings have prompted me to attempt this epic'; so, only my life-long love of the theatre and interest in such studies have prompted me to attempt this tradition. An important work like this deserves almost a life-loge study. I hope someone will feel sufficiently provoked by the guesswork of translators like myself to arrive at what the Natyasastra was originally like. Adya Rangacharya (1904-84), was born in Agarkhed, district Bijapur. He has his education at Bombay and London Universities. His writings were original and prolific, which made him a trend-setter among Kannada and Indian writers. His works include twelve novels and a number of scholarly book on the Theatre, on Sankrit drama and the Bhagavadgita; but it was as a dramatist that he made his mark (47 full-length and 68 one-act plays). Besides the translation of Natyasastra his other works in English are: Drama in Sanskrit Literature, Indian Theatre, Introduction to Bharata's Natyasastra, and Introduction to the Comparative Philology and Indo-Aryan Languages.